Home > Riding Days > More Bikey Shirts! As we’re slowly settling back into Portland, we’re working on some projects to keep the website and other bike travel plans going. 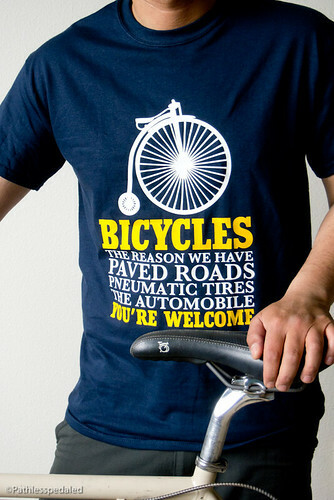 One of them is selling bicycle themed shirts. I dreampt up tons of ideas as we pedaled through New Zealand but haven’t had the chance to flesh them out on the computer because of the constant movement. If you haven’t checked out our shirt shop lately, there are quite a few new designs. I will be experimenting with hand-drawn and linocut designs on shirts in the near future. 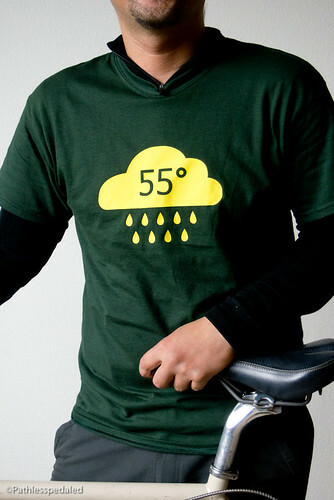 Check out our shirt shop today and pick up a great new bikey shirt to wear around town! 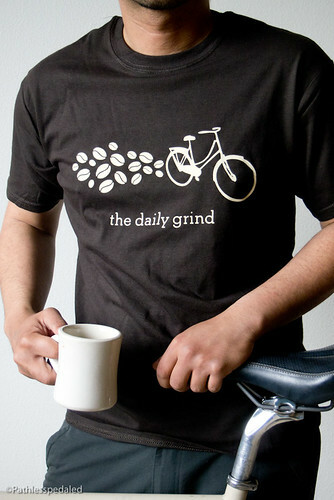 Also, if you are a bike shop or cafe that would be interested in selling the shirts, email us. I’m trying to gauge if there is enough interest to do wholesale orders instead of print-on-demand. Thanks for the article on mirrors. I am having difficulty with the Blackburn road bike mirror with it fogging over on foggy days and not useful on chip-seal roads (vibration). Never fits the hoods correctly either. Are you at the bike summit in DC this year??? Hello, I am interested in rejoining the ranks of bicycle riders, but am a little apprehensive after I had a shoulder injury several years ago. The injury was from a fall, here at my home. I was in P.T. 3 months. Can anyone give me some advice on how I can get back into riding? To get back on the saddle, so to speak? I guess I am nervous about another injury. Nice ! Do you ship them Shirts to the UK too ?